Today was the day. It was the day to try our luck and see if we would actually get into China. We were 15km from the border but unsure of what lay ahead, both in terms of physical terrain and the bureaucratic obstacles. Knowing that the Chinese side would shut at 11:00hrs and not be open over the weekend, it was a super early start as we packed the tent and started pedalling just after sunrise. After a couple of climbs we arrived at a one man hut next to a simple barrier, we presented our passports, they where inspected, handed back and we continued…. no questioning, no asking what we were doing. Maybe it would be easier than we thought? 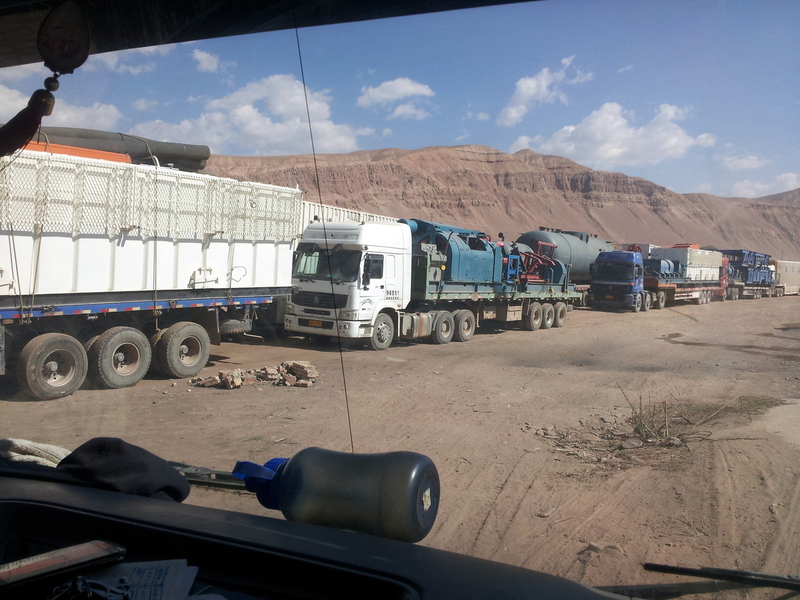 After another mini mountain pass on which the passports were checked again we eventually arrived at the Kyrgyststan border post, which was choc-a-block with Chinese shipping lorries. Here our passports were checked another five times before a smiley army guy (with machine gun) stamped them and said as he returned them – “Thank you for visiting Kyrgyststan”. We were on our way! Into no-mans and with excitement building we pedalled along the valley floor through check point after check point, wondering about the actual location of the border crossing. Eventually we came to a large building with a Chinese flag flying and another great big line of lorries, we had arrived! Bicycles are a queue-jumper’s ticket so we pedalled past all the trucks right up to the office! Much to our surprise we saw three other cycle tourists – the first people we’d caught up on our trip! 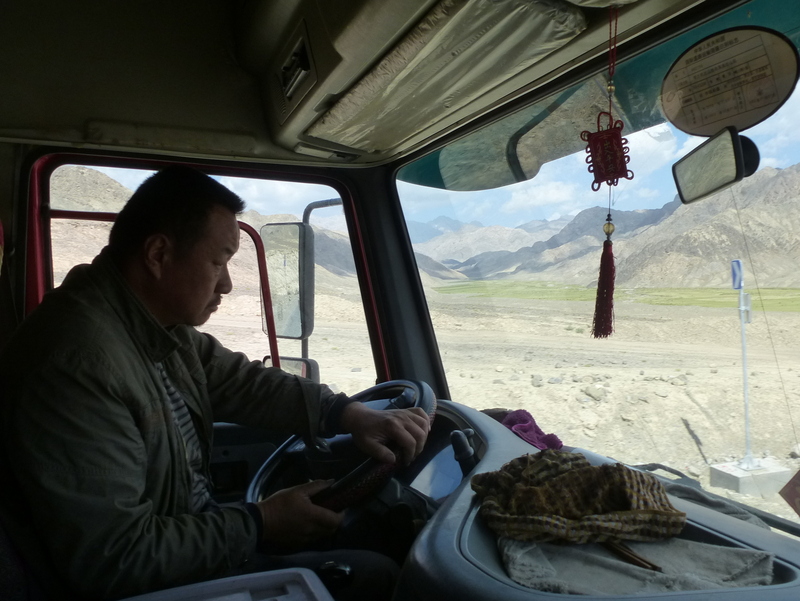 There was just enough time, before they were sent onwards, to have a quick chat and discoverer that we were all heading to the same hostel in Kashgar. 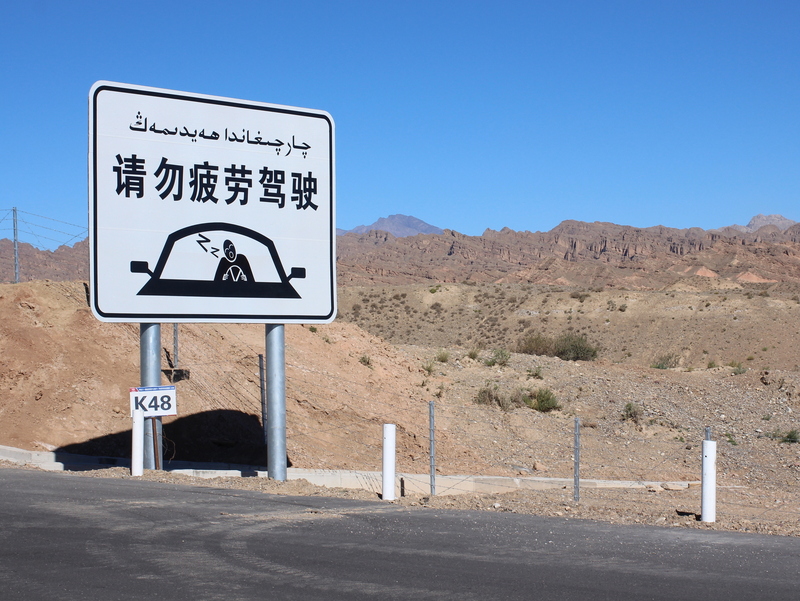 The Chinese have a new, and an old border post on the Irkeshtram Pass which are 142km apart. The road between the two was being replaced but it is not like English roadworks where they work on one section at a time and let you drive on the other side at a reduced speed. In China they close the road completely, along it’s entire length, and cut a dirt-road at the side of it. For 142km! Unsurprisingly, with so many heavy trucks travelling the route, it was pretty cut up with pot-holes, the occasional sand section and cliff-top hairpin thrown in for good measure! Standard speed limits applied: flat out. Standard road rules applied: Honk if you want the guy in front to go faster. Honk if there is a queue. Honk if there is a blind corner and you’re not slowing down. Honk if there is someone or something in the road. Honk to make sure your horn is still working. Do not under any circumstances reduce your speed. With our passports surrendered we were told to sit and wait. We would not be allowed to cycle on the unsafe and unfinished road (see above) so the border police would find an empty lorry to transport us and the bikes to the second border. After a short wait, both the bikes were loaded into an empty shipping lorry, Rebecca climbed into the passenger seat and they set off! Tim was left to follow behind in a flat-bed lorry. So with our bikes loaded and us in different trucks with drivers that spoke no English and not really knowing where we were going, we headed off onto the dirt road, hoping that we would all arrive at the same place at the same time and all in one piece! On the completion of any ‘tricky’ section, Tim’s driver would spit into the palm of each hand and then re-grab the steering wheel as though the phlegm would give grip! Combined with the constant hacking, coughing and spitting out of the window every 60 seconds it was definitely an adventure! Four hours later we arrived at the second Chinese border post, found each other, retrieved passports and bicycles (seemingly undamaged) and headed inside to complete some more paperwork. Amazingly we also re-joined the other 3 cyclists, so after several more passports checks, and the x-raying of our bags, we were all free to cycle into our Chinese adventure… we’d done it, we were in, we couldn’t quite believe it! Now as a group of five, we cycled into the nearby town, changed the last of our Krgyz money and sat down to our first meal of noodles! 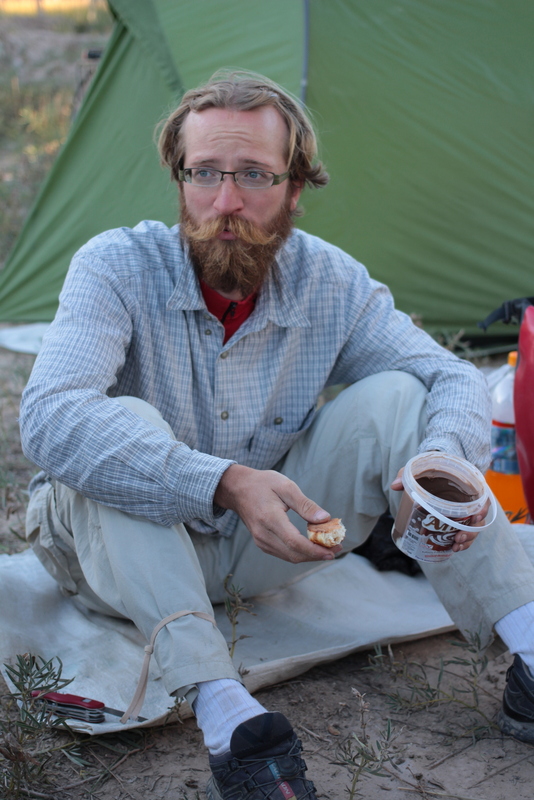 Chops sticks down, we bought overnight provisions and pedalled out of town to find a camping spot. With fading light and a puncture on one of the other bikes our camp spot chose itself. Our ground was an abandoned field just off from a unfinished section of new road, it was discrete, but not hidden and our four tents were soon spotted by the locals who suggested it was OK to camp. ‘Friendly Police’ with Rebecca, Marica and Zoltan – Moustached Simon, caught in the act with a tub of Nutella substitute! Later, two policeman came over to investigate, we indicated that we would sleep there and then continue to Kashgar in the morning. They seemed happy enough, took their photo with us, and out of curiosity had a look inside our tents before they went on their way. However, just as darkness fell, they returned, but with backup, to tell us that we had to retrace our steps the 10km back to town and find a ‘Tourist’ hotel. Our hearts sank. Using one of their mobile phones to speak to someone who could understand English, Tim explained the situation and said that we wanted to stay put. After much to-and-froing with the phone it became obvious that we weren’t really getting anywhere and they said a car would be sent to take us to the hotel! What, all 5 of us and bikes and bags.. in the dark? Marica, one of the other cyclists, then took over the negotiations and to our bewilderment started shouting and arguing with the Police! To our amazement it worked! They said bye-bye and left us alone to camp in peace! (It turned out that Marica had experience as a tour-guided in some pretty far out places. – Just don’t try it in Europe!) 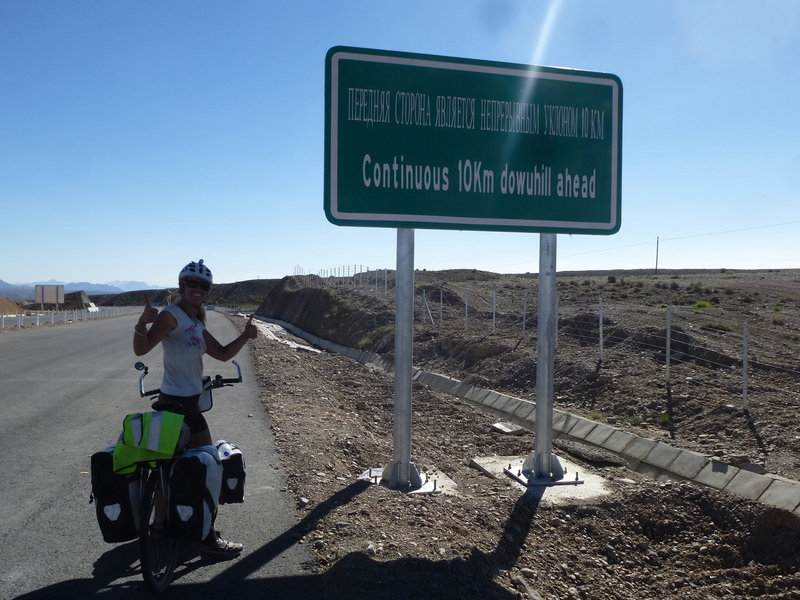 The next day we carried along the unfinished dual carriageway, enjoying the empty tarmac downhill all the way to Kashgar There we checked into the Pamir Hostel and set up a mini bicycle-gang with another 4 cyclists who where already there. We settled in, saw the sights and adjust ourselves to the madness that is China!